Home » It’s time to learn! » News » It’s time to learn! DataFromSky technology has added new possibilities to transport and road fields. It highlights a great need of people working in these fields – to be equipped with adequate tools for conducting surveys and collecting data. The purposes for which such data is collected places severe requirements on precision and reliability. Choosing the right methods and devices used for traffic monitoring and vehicle counting is a question of selecting the best ones for a given environment. All of this will be part of discussion in the seminary with title “Methods and techniques for the monitoring and management of road traffic” presented by Eng. 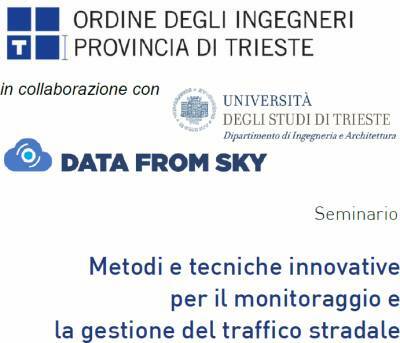 Andrea Marella (Trafficlab) and Eng. Erik Sferco (Trieste University), that will take place on Monday, 16th May at the Trieste University. Program for the whole day is available in the following link, with an explanation on how to participate for those interested. The rising interest shown by universities and official engineering associations demonstrates the growing confidence in DataFromSky and understanding what it is. We hope that these meetings could let traffic technicians know how powerful and innovative tool we are working on.